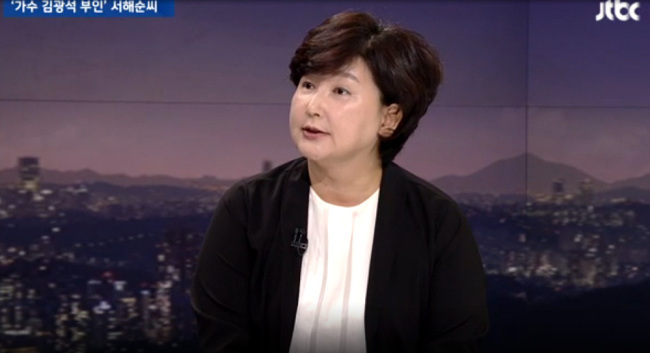 The elder brother of deceased folk singer Kim Kwang-seok was questioned by police Wednesday in connection with the mysterious death of Kim’s daughter, which had been concealed by his widow for a decade. 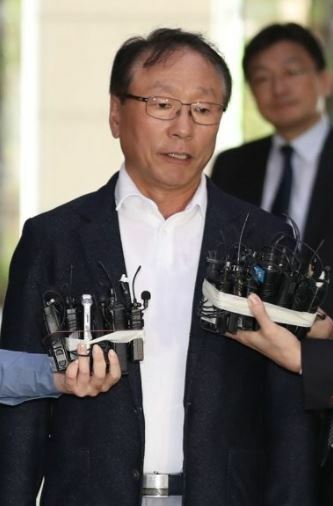 Police opened a case into the girl’s death from 10 years ago after Kim’s elder brother Kim Kwang-bok and a local reporter, Lee Sang-ho, filed a complaint on Sept. 21 against the singer’s widow Seo Hae-soon. The two claimed Seo might have caused the death of her own daughter Kim Seo-yeon and kept it a secret to gain ownership of her husband’s copyrights for his works, asking the prosecution to investigate how Kim’s daughter died and why Seo had hidden it for a decade. “In what Seo says, there are many lies, which are far from truth. I want the truth to be revealed,” Kim told reporters before heading into the police station for questioning, referring to what Seo had said during interviews with the media. He added that many parts of her claims were suspicious. Kim’s daughter died in 2007 at age 16 due to acute pneumonia, a type of lung disease. Seo did not reveal her death to the public and her family. Her death only came to light last week through media reports. Seo denied the claims, saying she had not reported the death to authorities because she was “not in a situation to talk about Seo-yeon’s death,” during an interview that local news outlet CBS aired Tuesday. Seo also said she did not tell Kim’s other family members about it as she had grown apart from them during court proceedings. “After my husband died, his family never asked me whether Seo-yeon was okay,” she said. Kim’s elder brother denied the notion, saying he had been curious about Seo-yeon’s well-being. “It is not that I didn’t want to see Seo-yeon. I just stayed far from her because I hated Seo (her mother) so much,” he said. Kim Kwang-bok, the elder brother of folk singer Kim Kwang-seok, arrives at a police station in Seoul on Wednesday. After Kim died, Seo and Kim’s other family members had fought over Kim’s copyrights in a legal battle. Kim’s family and the widow initially agreed that Kim’s father would own the singer’s copyrights and the rights would be handed over to Kim’s daughter after he died. When Kim’s father died in 2004, Kim’s mother asked for the ownership of the copyrights. In 2008, the Supreme Court ruled that the daughter had ownership. That was a year after she died. Seo still did not reveal her daughter’s death to the court, which Kim’s brother and the reporter claim was to sway the ruling to her advantage. Folk singer Kim died in 1996 at age 31 in what appeared to be suicide. Police concluded he had taken his life at the time. But some suspected that his wife Seo and her brother murdered Kim to claim royalties for the singer’s works. Amid burgeoning suspicions, Seo said that she would reveal an autopsy report on her husband and daughter to the public. Police are set to call in the reporter Lee on Thursday and Seo next month. Earlier this week, police called in several witnesses including emergency response units who arrived at the scene of her death and hospital staff members for questioning as part of the probe.